When power is lost, don’t miss a bit. The importance of uptime cannot be overstated for business PCs or field-deployed ones. Mini-PCs are increasing in popularity but remain vulnerable to power loss. 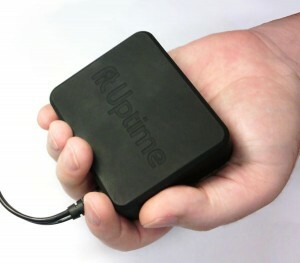 fit-Uptime is a miniature UPS designed for Compulab mini-PCs. Compulab developed fit-Uptime after identifying that this is the single most important element for improving fit-PC dependability. Plug fit-Uptime cable into the mini-PC DC jack. Plug the PSU cable into fit-Uptime DC jack. Power-up PC. Regression testing for sudden power loss and taking measures to protect the system against anything from file-system corruption to bricking: This is one of the most difficult stages in development of a new system. With fit-Uptime you can assume near perfect uptime of the mini-PCs therefore reduce testing. Mean time to failure of a mini-PC protected by fit-Uptime is often long enough to neglect the failure events. With fit-Uptime project managers should observe significantly reduced truck-rolls, reduction in RMA and higher customer satisfaction due to better uptime.